University School students and staff raise $7,500 to buy turkeys and other items for families living in Cleveland's Mt. Pleasant neighborhood. US's food drive is a 30-year tradition at the school. 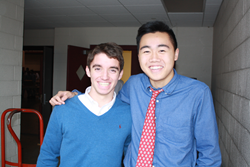 University School seniors Ryan Onders (left) and Eric Ma helped to organize the effort. Helping to orchestrate the food drive and helping those in need gives me a greater sense of perspective and a realization of just how lucky I am. Continuing a 30-year tradition, students at Cleveland's University School recently conducted an annual food drive to benefit Cleveland families for the Thanksgiving holiday. Students and staff raised about $7,500 to buy turkeys, potatoes, canned goods and other items to feed 240 families over the Thanksgiving weekend. Most of the families live in the Mt. Pleasant neighborhood of Cleveland, located on the border of Shaker Heights, Ohio, on Kinsman Road to 130th Street. At the school’s Hunting Valley and Shaker Heights Campuses, students sorted and packed food boxes, which were delivered to Mt. Pleasant NOW for distribution to the families. Since 2005, University School has worked specifically with the non-profit organization to make the Thanksgiving holiday a little brighter for its residents. At University School’s Hunting Valley Campus (grades 9-12), students raised funds to purchase enough food to feed 180 families. At the Shaker Campus (kindergarten- grade 8), canned foods and non-perishables were donated to prepare food baskets for 60 families total. Contributions came from students, their families and fundraising activities. Students at the Upper School participated in a “sparse” lunch. The money used for their normal lunches is donated to the food drive instead. Founded in 1890, University School is an independent day school, educating boys in kindergarten through grade 12. University School has two suburban campuses in Cleveland, Ohio: the Shaker Heights Campus for boys in kindergarten through grade 8, and the Hunting Valley Campus, which is home to students in grades 9-12. Visit our website for more information.